In 1999, the William J. Bingham Award, given to the top male athlete of Harvard’s senior class, was awarded to Tim Hill. Not only was Tim a four year letterwinner and starting point guard for the Crimson, but he also started all 103 games of his collegiate career. His name is a familiar one in the record books. He currently stands 9th all-time in career points with 1,385, 2nd all-time in career assist with 590, 6th all-time in career steals with 15, and 3rd all-time in assists per game in a career with a 5.7 average. His senior class won 58 games during their four year period, the most by a senior class at the time. Tim received recognition for his talent on the hardwood and in the classroom. 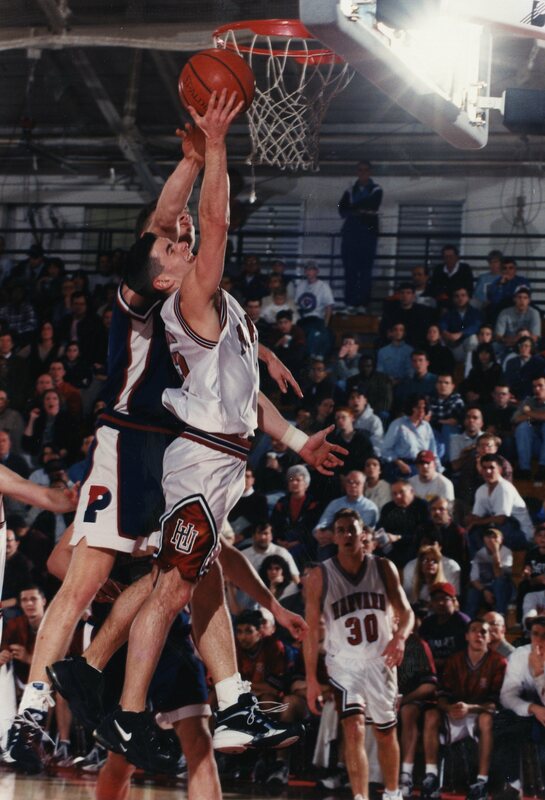 In 1996, he was named Ivy League Rookie of the Year and also earned an Honorable Mention All-Ivy selection that year. He was a Second Team All-Ivy selection in 1997 and 1998, and First Team All-Ivy in 1999. His teammates voted him the Raymond P. Lavietes Most Valuable Player in 1999. He was named to the Academic All-Ivy Team in 1998 as well as Second Team CoSIDA Academic All-American in 1999. His senior year accolades included Second Team All-District by the National Association of Basketball Coaches (NABC). Most notable of his senior campaign awards were the 1999 Bob Cousy Award for New England Players six-feet-and-under and the 1999 Chip Hilton Player of the Year Award, given by the NCAA to a Division I player who demonstrated outstanding character, leadership, integrity, humility, sportsmanship, and talent. I am so honored and humbled to be entering Harvard’s Varsity Club Hall of Fame. Thank you to God, my family, coaches and teammates, and Harvard basketball supporters. I look back on my time at Harvard with nothing but great memories and a real sense of happiness. I am so grateful for the platform that Harvard offered to me, both athletically and academically, and am very proud to represent such a world-class institution. My hoops teams at Harvard never quite broke through and won an Ivy championship. Each year we were in the mix, though, and at the time of our graduation our class had compiled the most wins in any four-year stretch in Harvard Men’s basketball history. Highlights my freshman year were having the program’s first winning season in 10 years and earning Ivy Rookie of the Year. Sophomore year finishing 2nd in the Ivy, winning 17 games, and beating UPenn at home (I hit a corner jumper at the buzzer that tied the game at the end of regulation. I jumped into Kyle Snowden’s arms thinking I had just won the game with a 3. He told me, while I was hugging him at center court, to relax my foot was on the line and we had to win in OT). Junior year playing SMU along with sightseeing in Texas and beating Brown by 48 in our season finale. Senior year toppling BC on the road and upsetting Princeton in OT on our senior night. I really enjoy thinking about these times and am so proud of all the memories created with my teammates. I also enjoy looking forward and watching the program now. I am so fired up that Coach Amaker and his staff have the ball rolling at full speed. Everyone associated with Harvard basketball knew the day was coming and strived to be a part of it. I could not be any happier that the day is now here and that Coach Amaker is doing it in such a classy and inclusive way. I am thankful to the game of basketball; it prepared me in many ways for the game of life. The person who helped prepare me the most for life is my Dad, and I wanted to especially thank him. It was quite a journey and commitment, on both of our parts, to walk down this path of fulfilling my aspirations. Whether it was advice, a car ride an hour away to high school, a talk over the phone, or just a shoulder to cry on, he was always there for me. The sacrifices made, time spent, and his level of interest in me will not be forgotten. He used to tell me that you never want to look back and feel like you could have done more with your time, because you cannot get time back. I am glad I listened to my Dad’s advice and am content that I poured everything I had into the game and got the most out of my time. Finally, I would like to thank the three most important people in my life. After graduation and playing professionally in Holland for a year, I was so fortunate to meet the woman of my dreams, Jenny, my wife, in my hometown. I had three months before I needed to start the real world in New York City, and because I had gone to high school down the road at DeMatha in Washington DC, had no idea she even existed up until that point. I am so thankful for those three months and that we found each other. Thank you, Jenny, for being such a terrific wife and friend, an honest person, and also a complete all-star Mom to our children. My pride and joy, Brady, thank you for lighting up my life every day. I love being Brady’s Dad. I know he can always lean on me like I did, and still do, on my Dad. The apple of my eye, Bailey, thank you for being so strong and having such an awesome personality. Your laugh, smile, and hand-holding warms my every day. God has truly blessed me with you three in my life, thank you!